Poster Intersecting circles abstract monochrome Repeatable pattern. Framed Poster Seamless pattern with small watercolor painted dots. Framed Poster Color circle abstract seamless background. Poster Seamless crosshaired target wallpaper. Seamfree vector target background backdrop. Poster Repeating geometric seamless pattern. Vector illustration. Framed Poster Seamless target wallpaper. Modern pop target background. Vector backdrop. Seamfree. Framed Poster Colorful abstract seamless background. Vector clip art. Self-Adhesive Poster Seamless vector pattern with colorful circles. 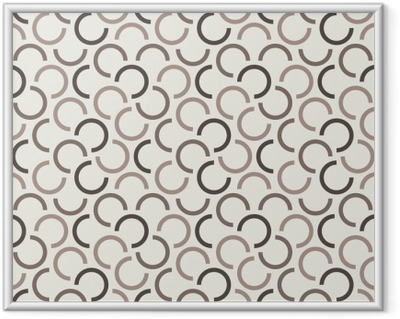 Self-Adhesive Poster Simple seamless textile pattern with color round elements. Vector background illusrtration. Framed Poster Repeating geometric seamless pattern. Vector illustration. Framed Poster Seamless abstract red pattern of striped circles in circles. Poster Vector seamless pattern. Hand drawn dots background. Messy grunge circles shapes textured print. Self-Adhesive Poster Repeating geometric seamless pattern. Vector illustration. Framed Poster Vector seamless pattern. Consists of geometric elements arranged on a gray background. The elements have round shape, different color and size. Poster Colorful abstract seamless background. Vector clip art. Poster Seamless blue circles pattern. Vector abstract background with watercolor bubbles. Poster Abstract seamless pattern with Round elements made up of small dots. Vector illustration on white background. Poster Simple seamless textile pattern with black round elements. Vector background illusrtration. Poster Seamless pattern with color grunge circle on a white background. Abstract vector background. Poster Color circle abstract seamless background. Poster Color line on dark seamless background.